Home / Worth writing about… / All / We are on Italian national TV! We are on Italian national TV! We had a lovely Italian TV presenter Gloria interview us for the national TV channel in Italy RAI a few weeks ago. 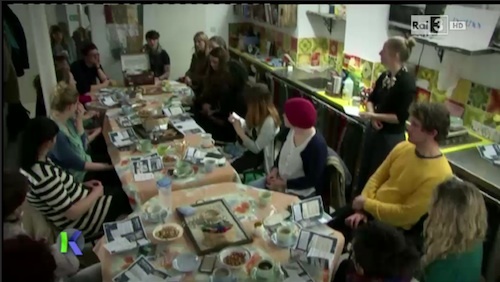 Gloria’s brief was to do a reportage on ‘new trends in London’ – I didn’t realise were were a trend but if it means our approach to craftivism can reach italian shores and encourage viewers there to get involved in our projects then great! You can see us from 4mins in and many of you will recognise the inspiring and pioneering Guerrilla Gardener Richard Reynolds at the beginning of the show too. Can you spot any craftivists you recognise? The workshop took place at the eco-craft emporium Fabrications, Hackney where we were making our Craftivist Footprints.